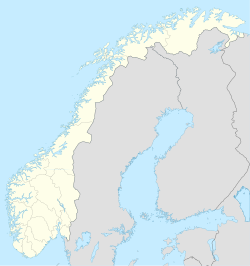 Stonglandseidet is a village in Tranøy Municipality in Troms county, Norway. The village has a population (2001) of 225. The village is home to a grocery store, bank, nursing home, Stonglandet Church, and a public school. The village is located at the southern end of the island of Senja on the isthmus connecting the main part of the island to the Stonglandet peninsula. It is located about 41 km (25 mi) northeast of the city of Harstad, across the Vågsfjorden. The village of Å is 8 km (5.0 mi) to the west, and the municipal center of Vangsvik is 32 km (20 mi) to the northeast. ^ "Stonglandseidet" (in Norwegian). yr.no. Retrieved 2012-11-23. ^ Statistisk sentralbyrå (2001). "Folke- og boligtellingen 2001, kommune- og bydelshefter 1927 Tranøy" (PDF) (in Norwegian). This page was last edited on 24 August 2018, at 02:35 (UTC).